The Original Simply Ghee 9oz. In the simplest terms: It’s a healthy butter – but better. Ghee is a butter that is heated and reduced until all the milk solids separate. Then those casein and lactose solids are cooked out and filtered 5X. You’re left with a healthy PURE good healthy fat – ghee. IS GHEE JUST CLARIFIED BUTTER? Clarified butter and ghee are not the same. Ghee is simmered and cooked longer than clarified butter, leaving it with all the health benefits + a richer caramelized nuttier taste. Some say it’s like heaven in a jar. Ghee also doesn’t have to be refrigerated. It’s always a spreadable consistency. And it has a longer shelf life. Ghee is one of the best healthy fats you can use. It’s rich in vitamins A, D, E and K.
It’s a fat that doesn’t make you fat. It’s high in butyric acid for good digestion. It’s free of lactose and casein. It’s the perfect balance of Omega 3 to 6. It contains a special kind of fatty acid, CLA. Some studies have shown that CLA – conjugated linoleic acid, can reduce body fat and blood pressure! And it has one of the higher smoke point and a greater amount of healthy fatty acids. If you don’t know, smoke points are kind of a big deal. Coconut oil is a healthy fat and has a smoke point of 350F. Which isn’t the lowest smoke point, but it’s not the highest either. We love coconut oil, but we don’t love using it daily because we love the unrefined version which makes everything we eat taste of coconuts! See how ghee’s smoke point measures up! 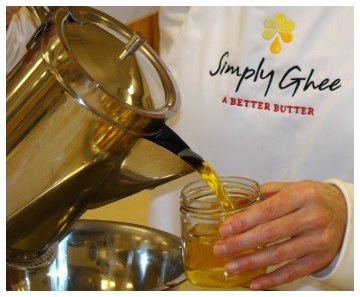 REASON 1: Simply Ghee sources butter from 100% grass-fed cows. It contains much higher levels of Vitamin K2, a nutrient that is extremely important for heart health. The Omega-3 fatty acid content, another critical component of a healthy heart, is greater. Levels of Conjugated Linoleic Acid (CLA) are higher. CLA is a naturally occurring, good trans-fat (as opposed to the bad trans-fats produced in a factory) that’s been linked to positive health effects, such as superior heart health and tumor suppression. It has been shown that pasture feeding leads to dairy CLA levels 3-5 times that of grain-fed cattle. There are higher levels of Vitamin A and Carotene, giving grass-fed butter its rich yellow color. 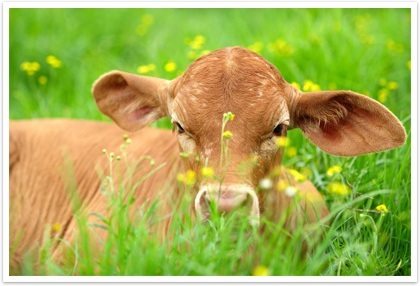 In countries where cows are mostly grass-fed, dairy fat is associated with a lower risk of heart disease! Aside from all the nutritional benefits, grass-fed butter tastes exceptionally better too. Ultra creamy and smooth, you simply can’t beat the satisfying flavor of butter that comes from happy cows that are free to roam outside and graze on what nature provides them. REASON 2: We make everything from scratch. No big crazy factory kitchens for these Ghee Gals. We cook everything from scratch in small batches. We use stovetop pots to make all our ghee. Making it the old fashion way takes only a bit longer, but we feel the quality and flavor is better than steam kettles. REASON 3: We don’t import butter, we get it locally. We think Lancaster, PA is one of the most magical places on this planet. It is full of local farmers, organic food advocates, and artisans. We like to work with people that we know, and from an environmental perspective, we prefer to source our butter locally than to import butter from other countries like Ireland, India, and New Zealand. YES, our butter is 100% certified organic from local farmers here in Lancaster, PA. We know exactly what they feed their cows, how they care for their cows, and why they have the highest quality butter because they all live in a 40-mile radius of us, in the magic organic food oasis that is Lancaster, PA. We are also 100% grass-fed. Which is SUPER important. When you look at ghee on the shelf, you may see grass-fed, pasture raised or organic ghee. If you want the best, healthiest ghee – look for grass-fed and organic. 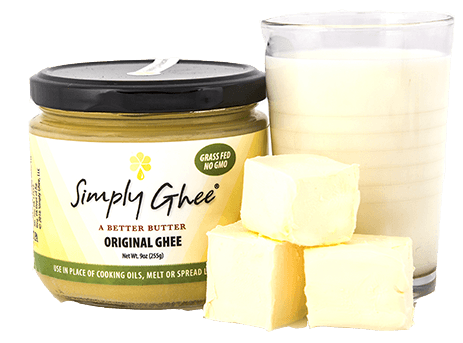 WHY DOES SIMPLY GHEE COST MORE? We aren’t the bargain betty’s of ghee. We believe in creating and providing you with the highest quality ghee product possible. Use 100% organic local ingredients whenever possible. Use 100% grass-fed butter from Lancaster, PA.
Cook our product slower in small-batches with stovetop pots. And we pour everything ourselves – making sure each jar is something we’d give our closest loved ones. Needless to say, this isn’t mass produced ghee but instead done lovingly, the small batch way. Ghee doesn’t go bad quickly because it doesn’t have any milk solids and very little moisture in it. Because of this you also don’t need to refrigerate it. Remember our food is all fresh and organic. It’s real and alive, with no preservatives, so it doesn’t last forever. NOTE: Never double dip a spoon. Double dipping your spoon can add moisture to your ghee and cause it to mold. 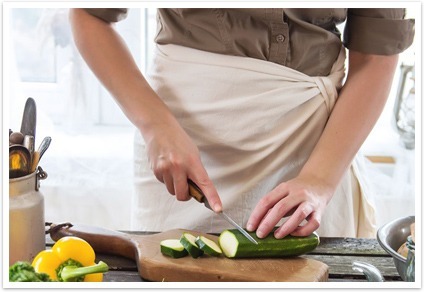 Always use a clean utensil each time you enter the jar to ensure a long shelf life. HOW DO YOU STORE GHEE? Store your ghee in the pantry with the lid on tight. I’M OVERWEIGHT, CAN I USE GHEE? If you are overweight or have health issues PLEASE consult your physician, natural or homeopathic consultant to make sure it’s okay to consume small amounts of ghee. HOW DO I COOK WITH GHEE? Any time you would use butter, olive oil, coconut oil, you can use ghee! Ghee is the perfect healthy cooking fat. Ghee is also great in butter coffee, in soup or spread on a piece of toast. 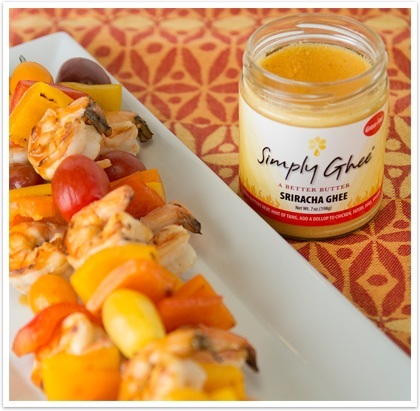 You can explore all of our delicious ghee flavors with your favorite recipes HERE. Foodie note: Always melt your ghee first, then add spices or mix with your other ingredients unless your recipe calls for cold butter. Also don’t forget – it’s always healthier to sauté your spices’ seeds first, then your ground spices. I’M ON THE WHOLE30, PALEO, KETO, OR LACTOSE-INTOLERANT – CAN I USE THIS? YES! Check out our recipes HERE. Sign up + save 15% off on your first order! Enter your email below and get the 15% coupon code.